In this article, we guide you through all the important factors you should consider before signing up with an enterprise web analytics vendor. Selecting a web analytics vendor is an important process. It’s not software you want to be changing every month, so it’s crucial to treat it as a long-term project and give yourself a decent amount of time to make up your mind. Particularly when you’re an enterprise-level company with a lot of stakeholders involved in the process and a bunch internal policies or procedures to pay attention to. Sounds like quite a challenge, right? That’s why we made this guide, to make the task easier. At least a bit. We’ll do this by presenting all the important features your web analytics software should provide to meet the expectations of business like yours. We hope they’ll prove useful. As an enterprise, you probably have strict policies that help you avoid mishandling the data you collect. Your internal protocols instruct you on who and when should be given access to certain information and what precautions you should take along the way. This helps you create a bulletproof technology setup and avoid data breaches, which are dangerous and expensive. According to a recent study by the Ponemon Institute, that isthe average cost for each lost or stolen record containing sensitive and conﬁdential information. Every new piece of software in your stack means you have additional security aspects to consider – after all, it’s one more person sharing responsibility for properly handling data. That’s why you’re probably wary about making changes. However, this doesn’t mean you should avoid introducing new technology to your organization. Just be extra cautious when selecting it. The safest solution in most cases is to choose a enterprise analytics module that gives you 100% control over your data. This way, you ensure that none of the collected data is shared with third parties, and that appropriate security and privacy policies are followed. That typically means deploying on-premises software. Here’s a post that will give you a good overview on preparing yourself for such an exercise: 5 Things to Consider Before You Set Your Mind on a Self-Hosted Web Analytics Platform. ability to host your web analytics on your own domain (analytics.companyxyz.com). We’ll elaborate on these points later in this article. If you still want to take advantage of a SaaS-based solution, this article will shed some more light on how to choose the safest among them: How To Tell If You Have Secure Cloud Analytics. Acquiring valuable insights about your clients should never come at the expense of jeopardizing your legal compliance. You can’t afford to violate your company’s own security procedures, nor its external regulations. We’re sure you understand that. whether they will be able to change the settings of particular sites or mobile apps analytics. This is extremely important if you want to make sure that sensitive information goes only to the people who are allowed to see it. Detailed logs of all activity taking place on the platform. That allows you to easily monitor and review login attempts, password updates, modification of instance settings, and any reporting API requests. This lets you manage all your users in a central database and employ SSO (Single Sign On) for logging into your enterprise analytics module using LDAP (Lightweight Directory Access Protocol), SAML (Security Assertion Markup Language), or other enterprise standards. With these kinds of privacy features at your fingertips, you’ll be able to provide top-notch data security. International companies must also be aware of the privacy laws of each country in which they operate. This could include European Union Member States, or the two countries with the planet’s strictest data processing regulations: China and Russia. In order to collect and process data about residents of those countries, you must have your own data center in each of them. As for particular countries of the European Union, a server located somewhere in the EU may be enough. Otherwise, you’ll expose yourself to severe ﬁnes, or even criminal charges in the worst case. Needless to say, before signing a contract with your web analytics vendor, you need to know how they are going to address this issue. There are also international data privacy policies you must adhere to. One of them is GDPR – the new EU data protection regulation. It aims to strengthen and unify data collection from individuals within the EU, and replaces the obsolete Data Protection Directive 95/46/EC. It’s the most stringent data privacy law that has ever been introduced. What’s more, GDPR will impact not only EU-based businesses, but virtually every entity dealing with EU-based customers. The right web analytics vendor should support you in fulfilling the obligations imposed by GDPR. This is why we advise you to contact your prospective web analytics vendor and ask how they’re going to deal with those requirements. If they can’t answer your questions, you should consider finding a more privacy-friendly solution. Read more on the impact of GDPR on web analytics tracking in this blog post: How Will GDPR Affect Your Web Analytics Tracking? As a company with thousands of employees, and even more users visiting your websites on a daily basis, you need to make sure that your web analytics solution can handle the traffic. Whatever steps you take here should also cover sudden spikes in traffic, when your website attracts even more interest from clients than usual (for example: in the case of healthcare, that would be the flu season, and in banking, this means holiday season when people do a lot of online purchases). Enterprise-level web analytics should handle heavy traffic in a way that won’t compromise the performance of your analytics nor the quality of insights you’ll receive. Unfortunately, many web analytics vendors deal with it by using data sampling. This is a method in which only a subset of your traffic data is selected and analyzed, and that sample is used to estimate the overall results. Google Analytics does it when you reach their limit of 10 million visits per month. To learn more about data sampling, this blog post should prove handy: What is Data Sampling and Why Should You Avoid It? That may be especially harmful for you if you want to push your data to other solutions in your stack – operating on only a subset of the behavioral data from your users can significantly skew the accuracy of your reports. That’s why your ideal enterprise web analytics module shouldn’t sample your data, regardless of how much traffic you receive. That’s another reason for you to consider on-premises web analytics – all the data is stored on your own infrastructure, so you decide how much information you want to keep on your servers. If you want to know how Piwik PRO can be scaled to handle high traffic, we encourage you to read this blog post: How Can You Scale Piwik For High Traffic Websites? As we said before, choosing a web analytics software is a multi-year commitment. So if you settle for one vendor, you probably expect them to be around for a while. That’s why it’s important to study their past experience and present condition. But sometimes things go wrong, and when they do, it’s much better to be safe than sorry. And in the case of web analytics, there’s nothing worse than discontinued technology that stops you from exporting your data to other systems. Years of your hard work would be rendered totally useless. Fortunately, there’s one thing that can cut the umbilical cord between you and your vendor. Once again, we’re talking about access to raw data. With this, whenever something goes wrong you just have to extract your data and push it to your new software. Sounds much better than losing it forever, right? Access to API or SQL (in this case, you’re free to adjust the code and enable connections between software by yourself – particularly useful if you use software developed in-house). There’s also one tool that, when used in conjunction with web analytics, can significantly reduce the hassle of managing analytics and marketing tags. Yes, we’re talking about a tag management system. In case you’re not familiar with this technology, here’s a super-short summary: tag managers are tools designed to give marketers better control over their tracking codes. Before tag management systems (TMS) were developed, adding tracking codes to your website required work from your IT department. And since web developers are among the busiest people in the whole company, the implementation cycle was often lengthy and frustrating. Particularly in the case of enterprise-level organizations, where on top of that you also have detailed internal procedures to cope with. Fortunately, with a good TMS you no longer need to involve the IT team in this process – it’s as simple as deploying a tag within the tag manager interface. You don’t even have to enter your website. This saves time and lets you act faster when a marketing opportunity arises. With a TMS at your disposal, you also get a safe environment to test your deployments without the risk of messing up the code or losing your data. the software will be useful not only for implementing analytics tags into your websites and apps, but also for managing tags and pixels of many other tools. These include ones used in user experience enhancement, conversion rate optimization, a/b testing, and remarketing. For these and many other reasons, we believe that a safe and reliable tag management system would be a great asset to your marketing technology stack. Assuming, of course, that it would work well with your other tools. The best way to be sure of this is by choosing a web analytics and tag management system designed by the same vendor. Since these tools are designed to complement each other, you won’t have to worry if they’re going to be compatible. To learn more about the capabilities of tag management systems, you can read these blog posts: A Quick Course in Tag Manager’s Usefulness. Your intranet is not only a collaborative space for your employees. It’s also a valuable source of information about your employees – like their behavior on websites or engagement in knowledge sharing. With the right information in your hands, not only can you enhance their experience with intranet platforms, but you can also encourage them contribute more to collaborative digital spaces. However, in the case of the most popular intranet platforms – SharePoint and Confluence – built-in analytics modules don’t give you much information to work with (you can’t track user click paths, check the duration of each session, attribute goals to events, or divide users into segments). Fortunately, there are intranet-dedicated analytics solutions that deliver more valuable insights. 5 Questions to Ask Before Choosing the Right SharePoint Analytics Solution. There are several vendors with their own native intranet analytics products. But wouldn’t it be handy if an intranet analytics module was one of the features provided by your web analytics platform? If you feel the same way we do, the list of software providers you could consider narrows significantly. Studies show that nearly 81% of brands use affiliate marketing programs. The chances are high that your company is also taking advantage of them. And once again, the best way to optimize your efforts in this area is with web analytics. By combining affiliate tracking data with your web analytics tools, you’ll be able to spot affiliate performance issues and get a better overview of user behavior in your affiliate channels. What’s more, you’ll be also able to share reports with your affiliates. With the right web analytics software, you’ll grant your affiliates access to specific website reports within your web analytics instance. This will let them assess their performance on a daily basis. By the right web analytics, we mean the one hosted on your own domain and with full control over access to data. You’ll be able to do everything without privacy problems or revealing too much information about your customers. The final thing we want to discuss is support. This is especially important because web analytics is certainly not the cheapest tool your company uses. So it goes without saying that it should bring real business value as rapidly as possible (at least within the first 12 months after purchase). Otherwise, it may seem like you’re throwing money down the drain. …so you can understand how to make the most of your data. …your vendor’s technical team should help you set up and configure your web analytics instance, and agree on a SLA ensuring all your needs are met as you use the product. …a quick training session in your tag manager’s capabilities will help you deploy and manage tracking tags across your websites. That way you’ll start gathering mountains of valuable data without unnecessary delays caused by IT overload. …around-the-clock monitoring of your solution’s performance and data collection process, plus backup management. …a first point of contact in case of emergencies or web analytics performance issues. That said, the scope of services will obviously vary depending on how much access to your infrastructure you give to your vendor. But even in extreme cases, when your internal data privacy policies prevent you from sharing virtually anything at all with them, you still need professional support. After all, it’s part of the nature of enterprise-level services. We hope that this blog post has given you a thorough overview of what to look for in enterprise web analytics solutions. Of course, you might still have some unanswered questions. If this is the case, we encourage you to read our whitepaper: 4 Simple Steps to Select The Right Enterprise Web Analytics Platform. 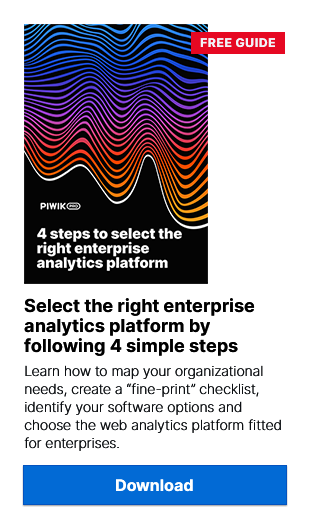 This guide will show you how to map your organizational needs, create a fine-print checklist, identify your software options, and choose the web analytics platform best suited to your enterprise. Or maybe you want to see a decent example of enterprise web analytics software with your own eyes. We invite you to take advantage of a 1-on-1 demo of the Piwik PRO Analytics Suite – schedule a call with one of our experts and see what you stand to gain with enterprise-level analytics software!